A grownup girl in a toy world. Cotton candy hair and pink Barbie shoes swinging in the wind. Dressing girly is just too much fun to stop. 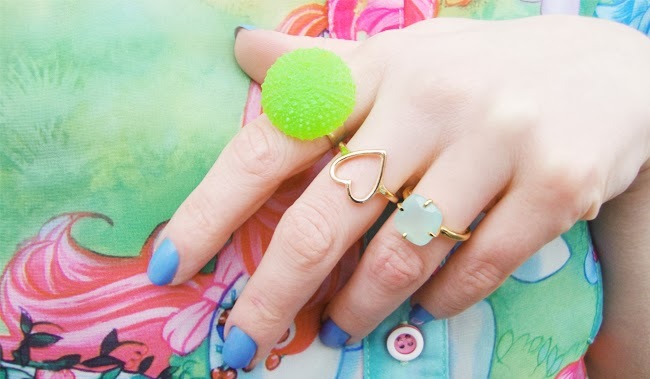 Finger Candy: I didn't used to wear a lot of rings, nowadays I can't understand this anymore. It's a little bit windy today, this puts my hair into a playful mood. Yes, I am wearing legs on my ears, why not? Not just Barbie loves plastic shoes, but me too. In love with this cute Vivienne Westwood x Melissa cuties. Is life a game? Unfortunately not always, but why not add some playfulness! Fashion is a perfect excuse to carry around your former toys the whole day, no matter what age you are. Of course I loved Barbie the most of all the toys. No surprise for a girl like me with a shoe cabinet full of jelly shoes and an addiction for pink. In this post you see the newest addition to my jelly shoe collection. 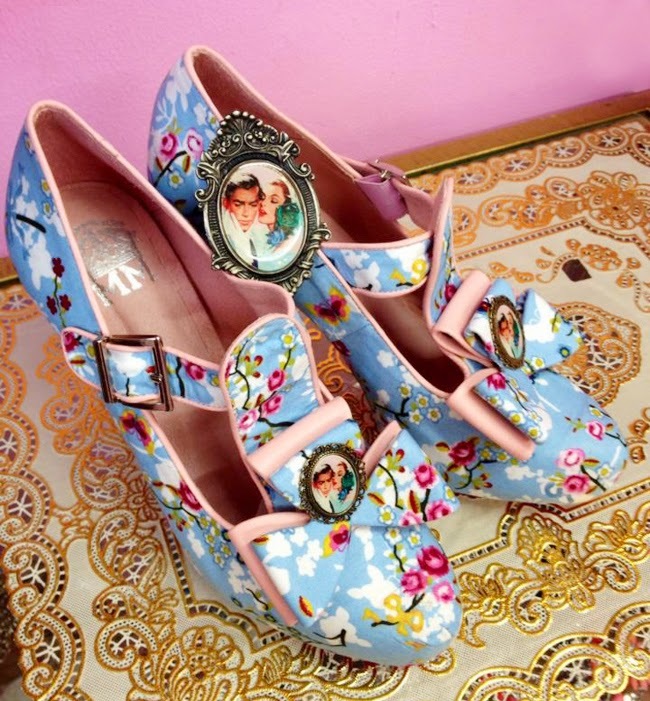 The amazing Vivienne Westwood x Melissa high heels came into my life through Zalando. It was a real pleasure to receive one of the familiar white and orange parcels, with the Melissa bubblegum scent already clearly recognizable from the outside. 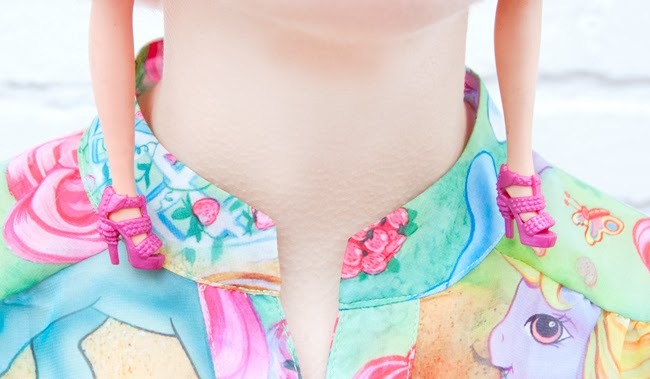 A toy world can't be complete without the ponies with their pastel manes from "My Little Pony", therefore they decorate my blouse. Years ago I used to believe that every age has dressing restrictions and this blouse would have been a no go in my eyes for a woman of my current age. I think since then borders have been loosened and people are more allowed to wear what they like no matter how old they are. I love this attitude and maybe I'll be a crazy old lady one day, still wearing Barbie earrings and pink lipstick. Why not? Staying cheerful isn't something anybody should ever loose! Do you wanna play with me? What are your thoughts about this outfit and toys in fashion? Thanks a lot to Zalando for the shoes and to Nina Bee and Serena Kuhl for the rings. Let me introduce you to a a very original and romantic label: Are you looking for witty shoes fit for a tea party in wonderland or a handbag to make even Alice herself jealous? Do you like girly things, flowers, bows and cute details? Then this is perfect for you! Moskitas Muertas is a Spanish label, based in Madrid. 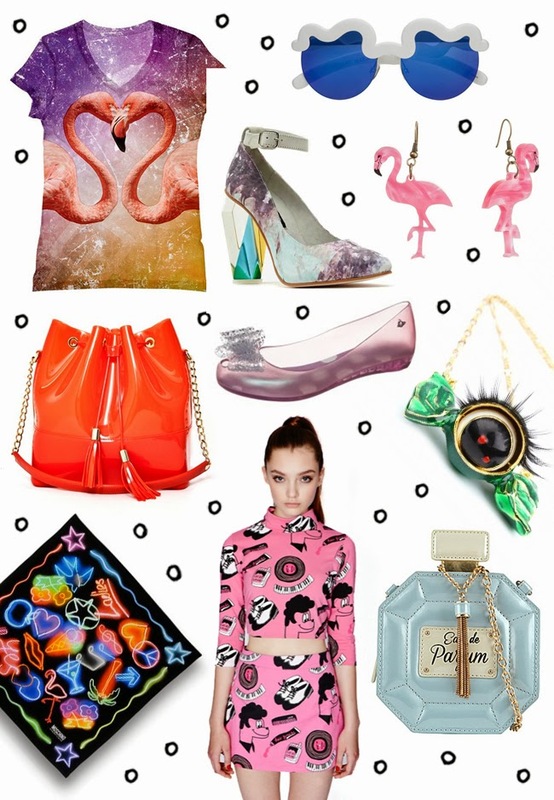 In their shop you will find exclusively designed bags, shoes, fascinators and jewellery. Everything is made in sunny Spain, using high quality materials. 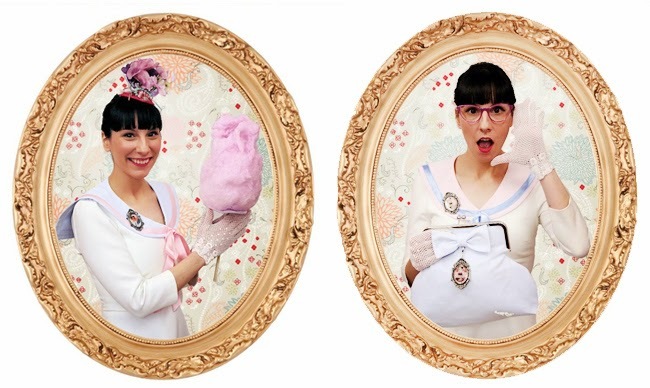 Moskitas Muertas dream is to create a magical world full of candy floss, rainbows, fantasy and love. Their new spring/summer collection is called "Made in Heaven" and looking at the pastel colored shoes with their sweet flower prints, the nostalgic granny style bags or the cheeky sailor collars with ribbons may indeed cause the most allured dreams. Everything comes with a big touch of retro style and you feel a love for the pretty things in life in every single piece. Visit Moskitas Muertas here and follow them on Facebook. 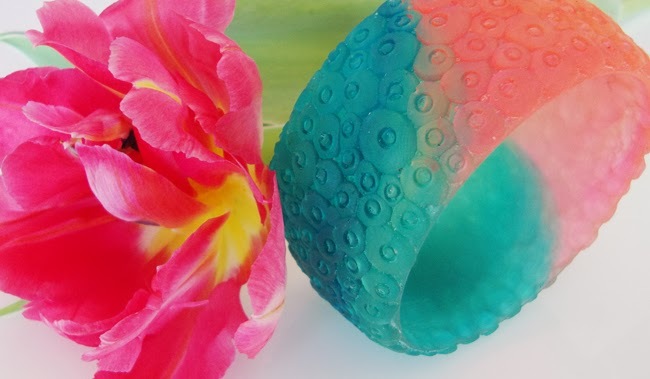 This beautiful bangle can soon be part of your perfect spring outfit. 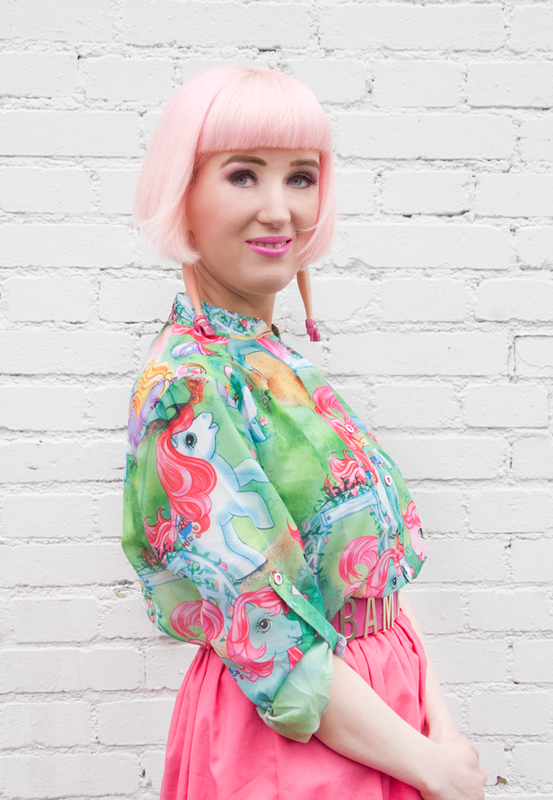 Vibrant colours are perfect for sunny days. What are you waiting for? Take your chance and make it yours! Time to treat you with something very special: You might have noticed that my collection of Serena Kuhl jewellery is constantly growing, because I am fascinated by the work of the Australian designer. 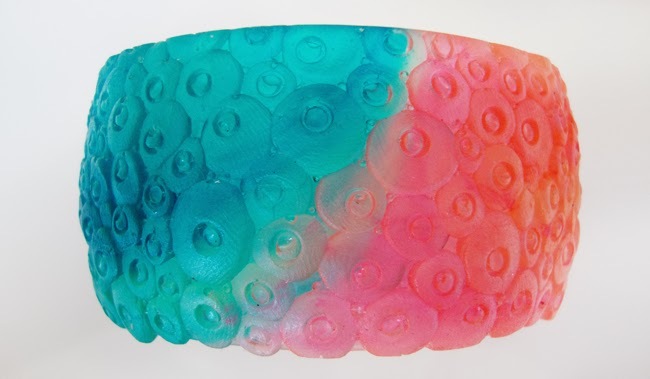 I would be a bad girl to keep all the beautiful things for myself and therefore I give you the chance to win your very own Serena Kuhl resin bangle. I chose one of my favorites from Serena's shop for you. 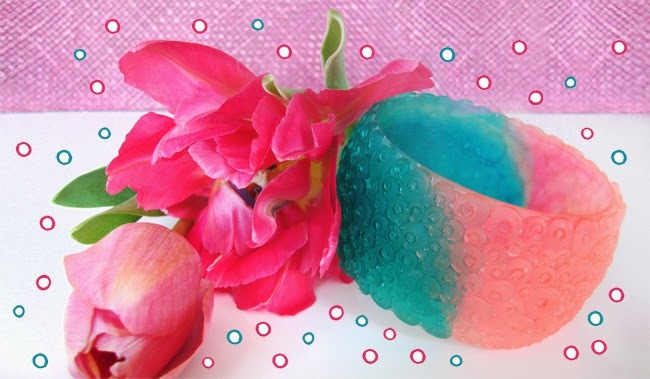 I think the vibrant pink and blue bangle will be the perfect accessory to go with your spring and summer looks. Do you already see yourself wearing it? -Then don't wait another second and enter my giveaway! Good luck! The giveaway is open worldwide. It closes on 8th April 2014 at midnight (CET). The lucky winner will be contacted via mail. - Follow "Sara is in Love with:" on GFC, or Bloglovin. - Follow "Sara is in Love with:" on Facebook. - Leave a comment on this post with your mail address. In case you win, I will contact you on the address you leave. Be sure to follow the rest of the rules on the Rafflecopter for extra entries. Will A Safety Pin Ever Rescue My Life? An outfit just like right from the sewing basket. Well, at least with a huge safety pin. If I say huge I mean massive. Agate slice in pink, an evergreen when it comes to necklaces. 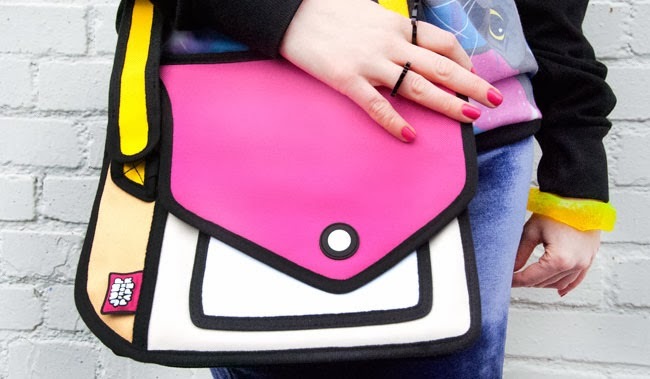 You are jealous of this bag, aren't you? I have a huge crush on it. An outfit with unusual much black for me, but I don't stop being colourful nonetheless as you see. Already my third pompom hat, but you must agree: It's too cute to not love it. Can't show you this bag enough. It's just big love! 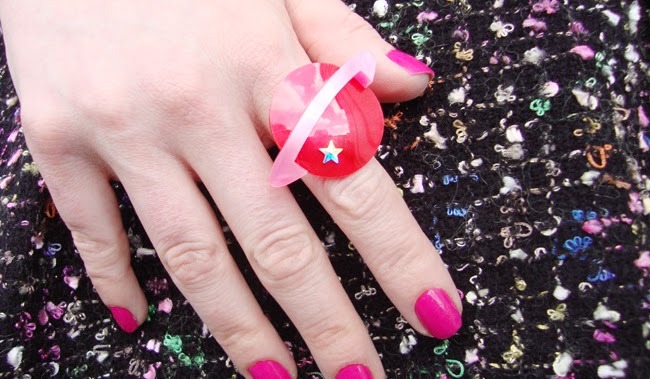 Saturn in red and pink: Perfect planet for girls? 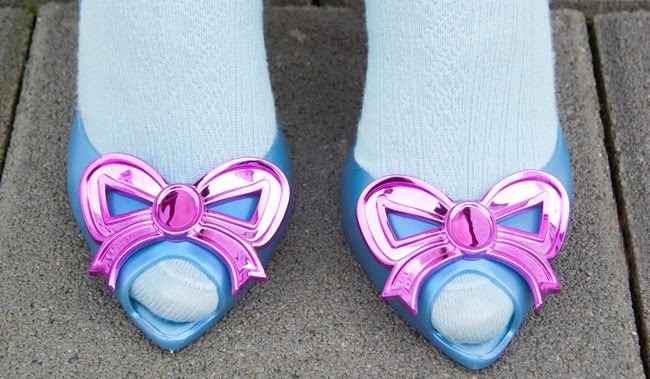 Will there ever come a time without frilled socks and jelly shoes? I don't hope so! I have no answer to the question if a safety pin will ever save my life, but at least when I googled the question I found a lot of stories which tell this actually could occur. No matter if I'll ever happen to end up in one of those situations or not: I love my new bag and think it's the best one I ever had. 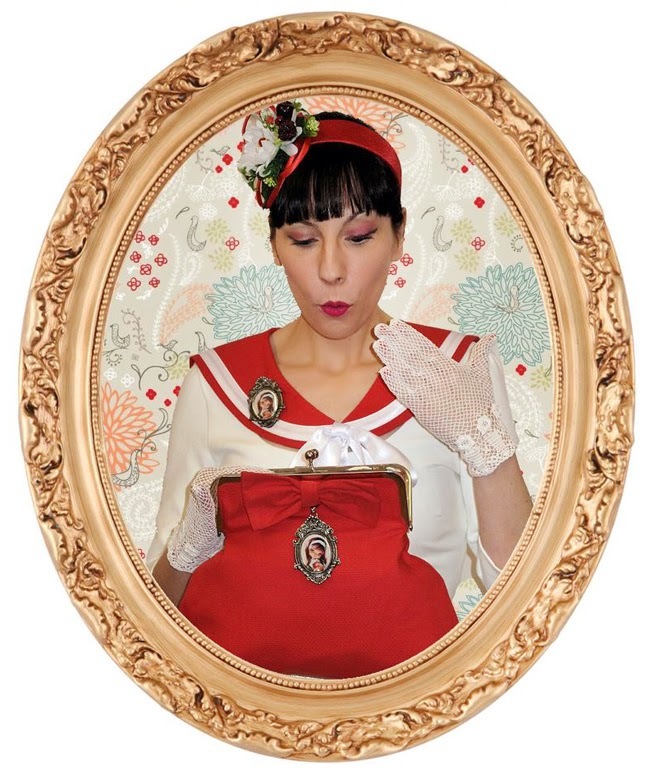 It was seen in the series Gossip Girl, Dita von Teese owns one and now Lovely Sara joins the club! I am always excited when parcels arrive, but this time the tension was even higher and I couldn't wait for the giant golden pin to arrive. 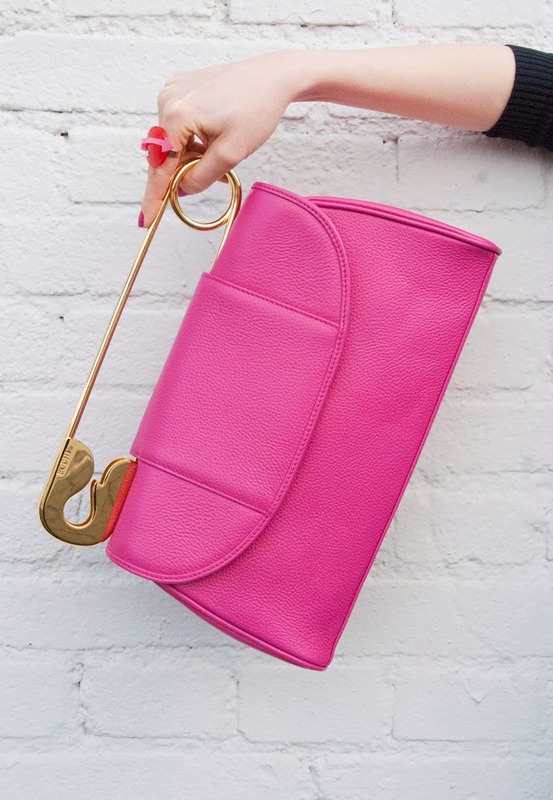 This bag is stylish, quirky and very well made and I am happy that the pink is far more vibrant than it looked on the pictures on their homepage. The dream of this amazing bag came true thanks to my beloved best friend and hairdresser who gifted me with it as a belated birthday gift. What a lucky girl I am! 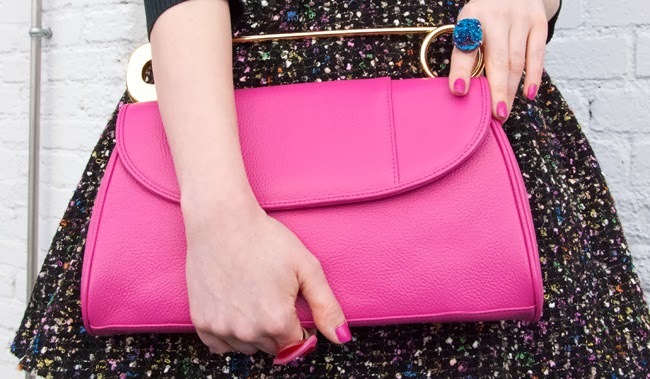 As you see, my love for the recently discovered combination of royal blue and hot pink continues. I think it's rather cool how the socks and tights contrast each other. The fascinator unites all the colours of my look and adds some more. Because I imagine safety pins and felt pompoms could live as neighbours in a sewing basket, my choice of fascinator was very conscious. With this dress it's the first time for a long while I bought something black (Ok, I cheat a little: There are colourful sprinkles). 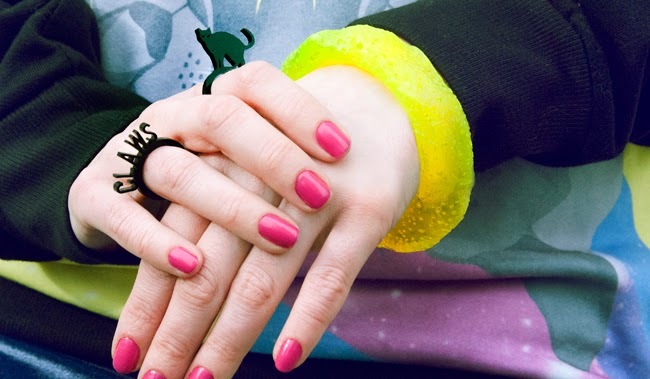 It's all about the accessories to make the look vibrant and give it a boost. Black doesn't have to look boring, it's all about the styling! Now I am curious to hear how you like this look! What's your opinion lovelies? Do you already have that feeling that spring is close as well? It's like a tickling in my fingers, this feeling of new things coming and the birth of change. Spring is the perfect time to get rid of unwanted things and habits! Time to sort out old things and feel as light as a bird in the sky afterwards. My life seems to change fast at the moment. I don't know where it leads me, but I know there are exciting things to come. The approaching spring is just the boost of energy needed to face the future and open the next page of the book called "Lovely Sara's Adventures". After a proper spring-clean, it's definitely time to treat yourself with a reward! What better reward is there than something thrilling in your wardrobe? The days of moody winter are numbered, time to colour yourself, colour the world! What from my list do you like best and would you love to see in my future outfit posts? I discovered a label I just have to share with you: Let me tell you about the exciting Australian brand Laurel & Hector, which is named after the grandparents of their designer mastermind Kee Kee. 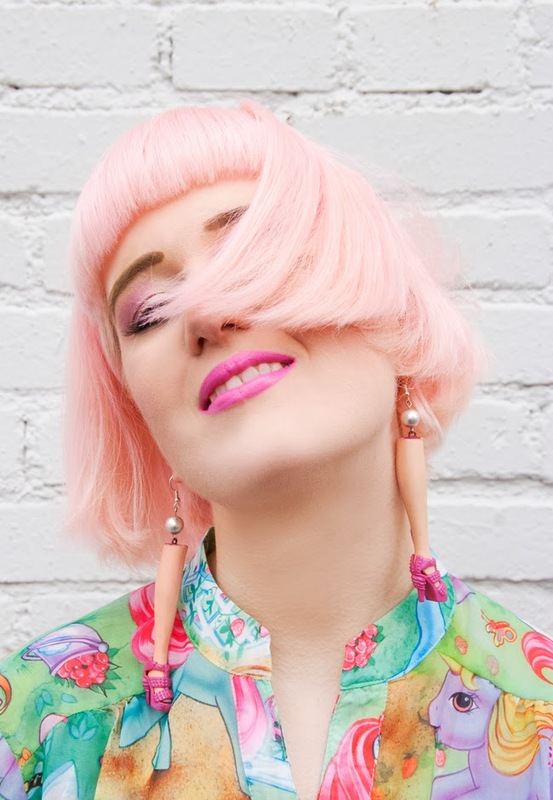 Laurel & Hector says about themselves that they make fashion for hot babes in bright lipstick looking for unconventional and high quality outfits. This sounds just like the perfect thing for you and me, right? 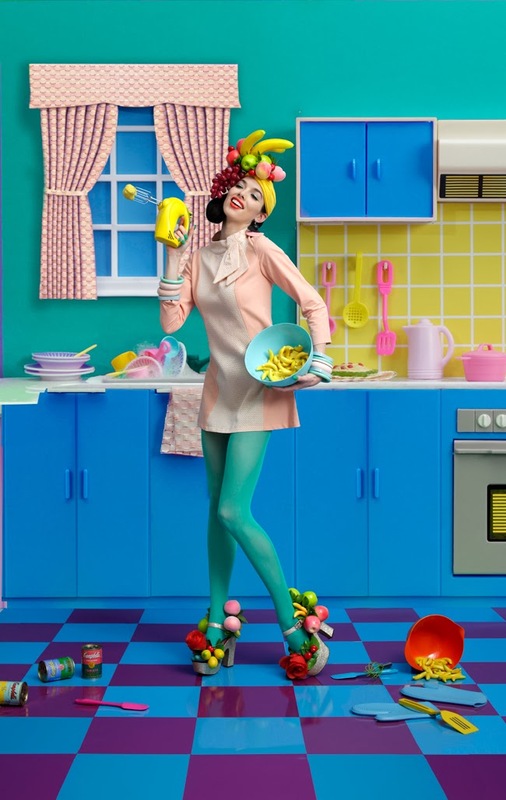 The latest Laurel & Hector collection called "Lip Service" comes with a big bash of Sixties chic, juicy fruits for Carmen Miranda fans and Clueless inspired looks in bright plaid. Everything is colourful and bold, especially yellow pieces rock their collection. If you need another reason for this fab fashion: See on the last picture how well their clothes fit to the best shoes in the universe, our beloved Melissa shoes. I am absolutely in love with their banana items. No big surprise as you already know about my addiction for fruits in fashion. The pop art style banana headband is just the cutest accessory to complete the crazy fruity look. Totally cool, totally bananas! Visit Laurel & Hector here and like them on Facebook. Copyright of all pictures by Laurel & Hector. 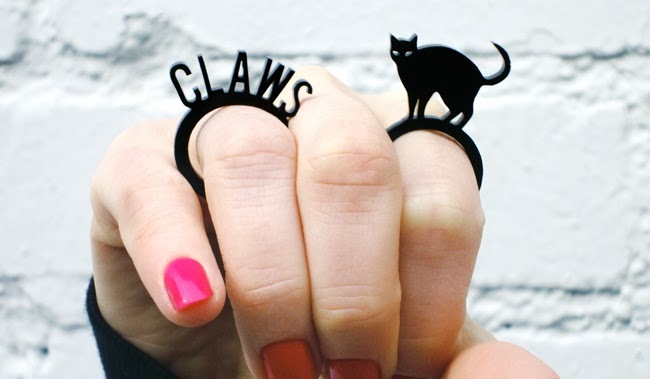 Showing you my claws today. But don't worry: I love to purr as well. Cats are such cute animals, don't you think? More cat love displayed on my fingers. 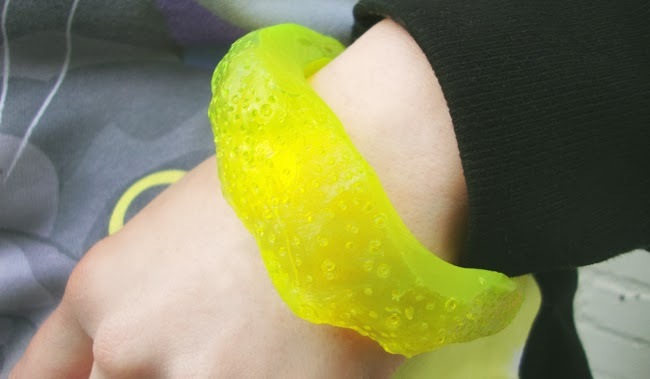 And a brand new neon yellow Serena Kuhl bangle. I am fascinated by the intense colour. Pink, blue and yellow with a hint of purple, a new hit combination? 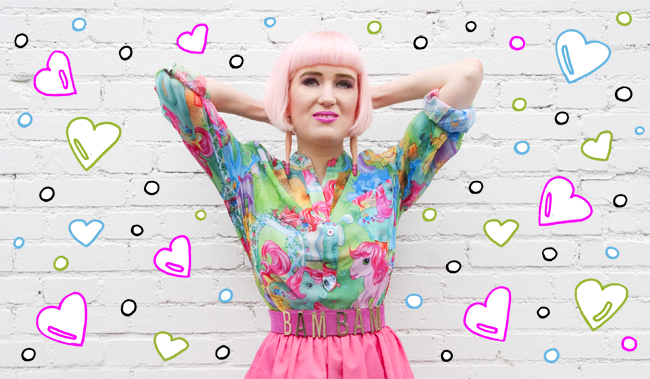 Feeling good, so colourful, comic styled and quirky. The probably brightest bangle I ever had. Neon yellow rules! Cartoon style is my style! Love the irritating looks whenever I wear my comic bags. 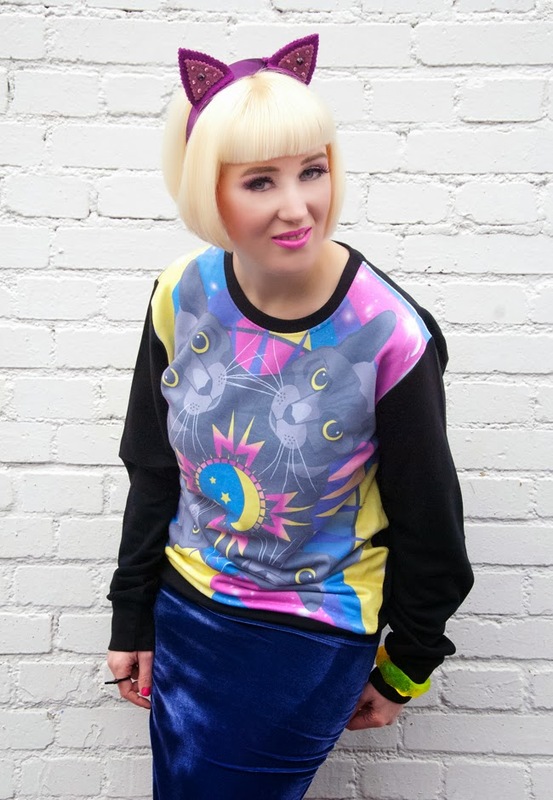 Every now and then, it's time for a cat themed outfit, don't you agree? When I saw this sweater from Dazzle & Jolt, I knew that the time has come again. It reminds me a little bit of my beloved series Sailor Moon, with the moon symbol and I love the colours. Do you remember the cute guardian cats Luna and Artemis from the series? Since I have this sweater, I started to think about Sailor Moon more often again, what sweet memories! I am already tempted to get myself a pendant inspired by this anime. Is it childish to still love one's childhood heroes? I don't think so! Why should I ever loose the last piece of my inner child, if cute things make me happy? The cat on the sweater is called Jarvis and he is kind of a third member of the Dazzle & Jolt team. I love that they made a jumper with him on it. Since I've seen pictures of the real Jarvis, I can confirm that he is absolutely recognizable and I am very happy to have him in my little Dazzle & Jolt collection. Next goal: Their unicorn T-shirt. 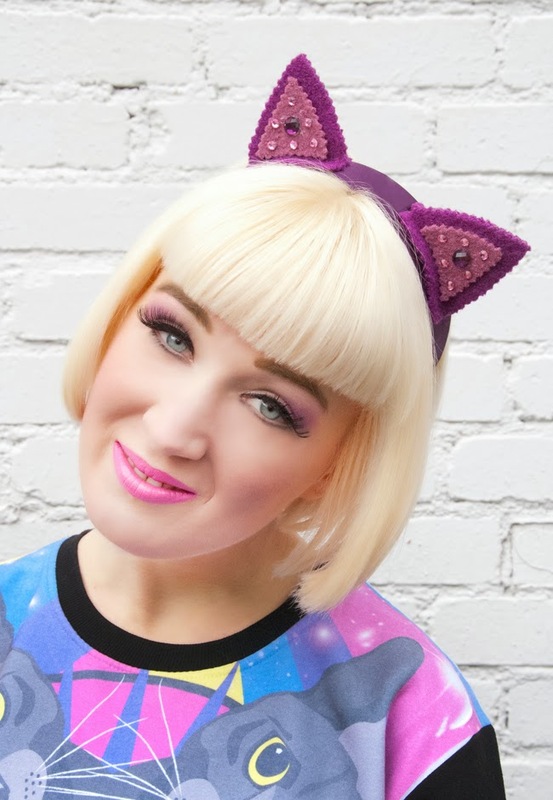 Not even the perfect cat jumper is enough cat stuff for me, so I added two feline rings as well and transformed myself with cute cat ears. Meow! I am off for today, might purr a little, have some milk and look out for mouses. See you soon and please tell me what you think about this look my lovelies. Thanks to Dazzle & Jolt for the jumper, to Jump From Paper for the bag, to Serena Kuhl for the bangle and to Jazzafine for the headband. And last but not least thanks to my dear friend Tessa for the rings.